What’s the Scoop on the Hurricane Irma + Hurricane Harvey Relief Drive? 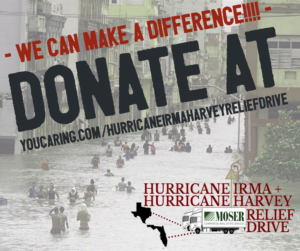 – The Moser Group Inc.
What’s the Scoop on the Hurricane Irma + Hurricane Harvey Relief Drive? 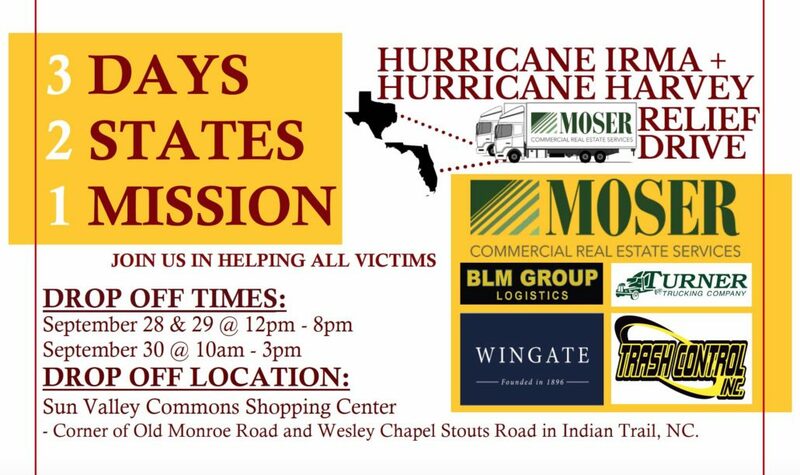 As some of you may already know, The Moser Group Inc. has partnered with Wingate University and the community to help those in Texas and Florida affected by recent hurricanes, Irma and Harvey. Starting today, volunteers will load supplies donated by The Moser Group, Wingate University and the public in two 18-wheeler trucks over a span of three days in the Sun Valley Commons Shopping Center located in Indian Trail. Each truck will then deliver the supplies to the affected areas. We have partnered with Out Reach America in Houston, TX and Palm Beach Atlantic University in West Palm Beach, FL to help un-load, organize and distribute to those in need. We created a You Caring site so that those who are unable to physically donate supplies or cannot get to our locations during our drop off times can still have the opportunity to be involved in some way. The Palm Beach County Food Banks are in desperate need for food supplies. The food bank has sent food to shelters all over during Hurricane Irma, which has depleted their supply and they still need to supply their regular pantries that rely on them. Now even more food is needed, as people lost everything in their fridge and freezer. 100% of the money collected on http://www.youcaring.com/HurricaneIrmaHarveyReliefDrive site will go towards replenishing the Palm Beach County Food Bank. Our goal is to raise $50,000 and as of this morning we are at $12,225. We have continued to encourage everyone to be involved in some way whether that be through prayer, gathering and dropping off supplies, or donating as little as $5 online. We believe that every bit truly counts! We are so blown away already by the donations and involvement by our community! For instance, the Hurricane Relief Drive hasn’t even begun loading the donations and we are already anticipating the demand of another 18-wheeler truck. Upon hearing about members from First Baptist Church Indian Trail helping to rebuild an elderly couple’s home, companies like Shaw Industries, Graybar, Hinson Electric, John Stone Supply, Indian Trail Hardware and Wingate University rallied together to donate enough carpet, wiring, floor coverings, electrical supplies, adhesive, furniture, a HVAC unit, paint, etc. to not only help re-build that home specifically but then to build two brand new homes as well all in Houston, TX. Congressman Robert Pittenger couldn’t help but address the U.S. House of Representatives on Monday to bring awareness and attention to this Hurricane Relief Drive stating that, “Commitment to charity and compassion for victims of natural disasters is truly what makes America great.” We couldn’t agree more. So how about it, will you continue to help us bring awareness to the Hurricane Irma & Hurricane Harvey Relief Drive? Remember, in just 3 DAYS we can help 2 STATES because of our 1 MISSION. Continue to join us in helping all victims!